Whether you have a single succulent plant on a window sill, a small collection in a cold frame, or a greenhouse bulging with succulent plants, I hope that you find the following hints and tips useful. This information is of a general nature, based on the accumulated experience of a number of growers. However, the owner of this page cannot accept liability for any plant loss, or damage, or personal injury arising from use of this information. One of the best methods of obtaining information about growing cacti and succulent plants will be to join your local Cactus and Succulent Society, where you will be able to obtain advice from other members, and take advantage of their experience in growing some of the more difficult succulent plants. There are also specialist societies for those interested in growing particular types of plants including Asclepiads, Euphorbias, Haworthias, Hoyas, Mammillarias, the Mesembryanthemum group of succulents, Peperomias and Sedums. Two types of pots are available, clay or plastic and the choice is mainly a matter of personal preference. Plastic pots are lighter, cheaper, require less watering and are easy to keep clean. Clay pots can provide stability for tall plants and can help to mitigate the effects of over-watering, but their accumulated weight requires strong greenhouse staging. Whichever type of pot is chosen, it must have a drainage hole and the bottom should be lined with several pieces of broken clay pots or large clean gravel to assist with drainage. Many cacti and succulents have fibrous roots and do not require or use the full depth of a standard pot, and half pots or pans are more suitable. Putting a shallow rooted specimen in a deep pot is counter-productive as the soil below the reach of the roots will stay wet for prolonged periods after watering and may become stagnant. Those species which have tuberous or tap toots often require a deeper pot and will probably grow better in a standard pot or even a "long tom" if you can find one. Bonsai pots can look very effective with caudiciform plants where the caudex (a swollen root or lower stem) is raised up above the compost. 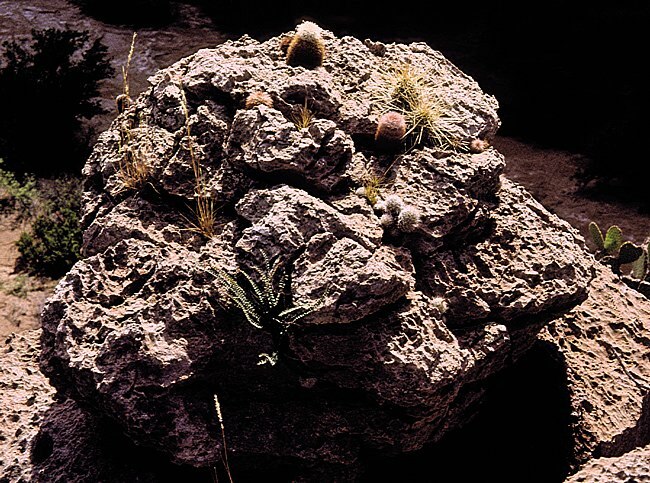 Finally, some cacti and succulents are native to limestone areas and often seen growing in cracks in limestone boulders. Such lime-tolerant plants are suitable for planting in a block of tufa and can look very effective as an alternative to alpines. As an example, my own potting mixture is based on sieved compost made from vegetable kitchen waste and leaves, weeds and other waste from the garden. This material accumulates and decomposes in a large green 4 ft tall plastic composter, obtained from the local council for a small fee. Unlike peat, and possibly because of a small soil mineral content, this compost doesn't seem to encourage sciarid fly larvae and root meally bugs. To the sieved compost is added about a third by volume of equal amounts of sharp sand and 2 mm flint/quartz grit which I also use for top dressing. Measuring with any convenient container that comes to hand or even by handfulls is sufficiently accurate. So this recipe amounts to four handfulls of compost to one of grit and one of sharp sand. For species known to come from limestone habitats, I substitute ground dolomite of lime for the sand. More grit is added for "difficult" species. The whole mixture is then packed into a stainless steel cooking container, sufficient rainwater added to ensure a moist consistency and the sealed container heated in an oven (e.g. 250°F for > 2 h). This treatment is essential to kill insects, larvae, eggs and seeds which may be present in any garden-based product but leaves some of the beneficial soil microoganisms, particularly those that form spores. Many different types are available commercially, ranging from John Innes soil based composts to peat based and recycled garden composts. Add horticultural grade sand and grit to make the mixture porous; the final compost contains between 30% and 70% grit. You may have to experiment a little to find the best proportions of compost, sharp sand and grit for your growing conditions and using locally available materials. Many plant nurseries grow and sell succulent plants in peat based compost. The first thing I generally do with my new plants is to repot them into my own loamy mixture. Repotting provides an opportunity to examine the condition of the roots. Peat based composts appear to encourage root mealy bug compared with soil based compost, and many growers feel that Lithops (living stones) grow atypically in peat-based media. I have personally moved away from growing in peat based compost in favour of soil-based mixture (see opposite) except for plants that clearly need to grow in peat e.g. carnivorous plants. Coir fibre is becoming a fashionable alternative to peat, but is said to break down too quickly for use with slow-growing succulent plants like cacti. Most cacti and succulent plants prefer a slightly acidic compost (pH6). If in doubt, this is the best choice for most species, but also avoid watering with strongly alkaline tap water. Simple, affordable pH meters are sold in many garden centres. Some species e.g. Echevierias really hate lime and are probably suited to a peat-based compost. Others e.g. Ariocarpus fissuratus, Echinocactus horizothalonius, Escobaria tuberculosa always seems to grow on limestone in their habitat and may appreciate a proportion of ground limestone or dolomite of lime in their growing medium. Still other plants e.g. Geohintonia are noted for growing on nearly pure gypsum cliffs. Ground limestone is calcium carbonate with a mild alkaline reaction neutralising soil acids. Dolomite of lime is a mixture of calcium and magnesium carbonates with a mild alkaline reaction. Gypsum is calcium sulphate, neither acidic nor basic. Garden Lime is calcium hydroxide and has too strong an alkaline reaction for use in potting mixtures. Ideally, succulent plants should be re-potted every year to provide fresh compost and room to grow. This is also an ideal time to inspect the roots for diseases such as root mealy bug. A good way of handling spiny cacti or spiny euphorbias during repotting without breaking the spines is to wrap a roll of newspaper or paper towel round the sides of the plant. This may be kept in place if required by elastic bands or a wire twist tie. If the spines become entangled, wetting the paper will make it easier to remove, and small bits can be taken off the spines with tweezers. 'Old hands' often handle plants with bare hands during repotting by distributing the weight on the hands between as many spines as possible. However, this is not recommended with Opuntia sp. as the fine spines (glochids) will break off and become embedded in the skin, or with Mammillaria species with 'fish-hook' spines that tend to catch in the skin. Remove the pot and clear away the old compost from the roots, keeping an eye out for pests. Use a thin stick or plant label to tease out the roots and remove old soil. If you see white fluffy patches in the soil and tiny insects, similar in shape to woodlice, but about 2 mm long these are root mealy bugs. If you find any pests, remove or wash off as much soil as possible, and soak in systemic insecticide. I used to use a formulation containing dimethoate biut this is now unobtainable so I use one based on imidacloprid which is less toxic to plants and people. The Euphorbiaceae comprise a fascinating group of succulent and non-succulent plants, with a wide range of growth forms and sizes, and are well worth growing. However, the milky latex characteristic of plants in this group is very poisonous and should be treated with respect. Euphorbia latex should never be allowed to come into contact with the eyes and any contamination should be washed off the skin immediately. It is a good idea to make a habit of washing one's hands immediately after handling or re-potting any Euphorbia species. Most cacti and succulents need as much light as possible, and a south or south-east facing windowsill, conservatory, cold-frame or greenhouse is ideal. The type of plant that can be grown in these different locations is mainly limited by the minimum winter temperature that is likely to be reached. Lots of sunshine is essential to prevent plants from becoming "drawn" and to promote flowering. Although cacti often grow naturally in intense sunlight, they can become adapted to the lower light intensities in e.g. an English climate. Therefore, beware of scorching during the first sunny days of Spring after a long, dark winter. Newly-acquired succulent plants or those grown under shading or low down on the greenhouse staging should be adapted to full sunlight over a few days. 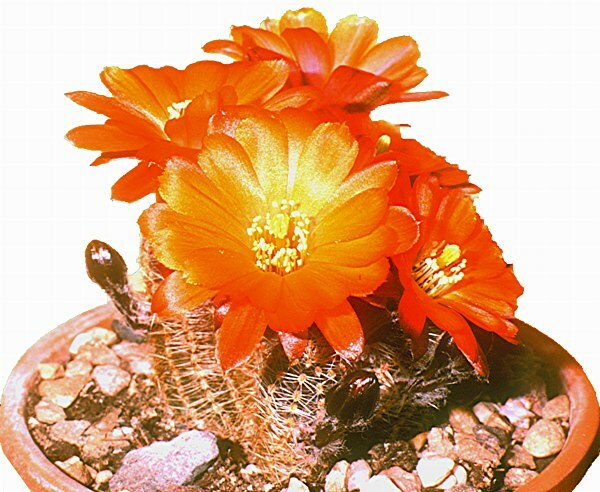 Bud production in Sclumbergia / Zygocactus is affected by day length and temperature. Day lengths of less than about 12 hours should initiate bud formation and low night temperatures ( e.g. 40 - 65°F) should accompany short day length. Buds should become visible 10 - 20 days after suitable short day lengths occur or are artificially imposed, after which day length will not affect development, (except that too little light may cause bud drop) but obviously may affect initiation of a second crop of buds. It is recommended that use of fertiliser be discontinued 3 - 4 weeks before bud initiation, and rainwater only then be given. Flowering is typically 7 - 8 weeks after initiation, so start around Halloween (31st October) for Christmas. Flowering can be inhibited by quite low light levels beyond the natural day-length - the literature suggests 5 ft candles is enough i.e. artificial room lighting, but personal experience with plants in my living room suggests that they are not as exquisitely sensitive to brief periods of illumination by artificial lights as are Poinsettas. A flowering period from mid-November to March is quite possible. However, the low day-light levels of an English winter may not give the plant sufficient energy to produce flowers. My plants get some supplemental limited hours of artificial light as they are grown on an illuminated rack. Some of the new coloured hybrids (e.g. Gold Charm) have "temperature sensitive" blooms. Flowers opening below ca. 60°F have a pink colouration that becomes more pronounced at lower temperatures and is disappointing if you are trying to develop a multi-coloured collection. The solution is to keep plants warm during bud and flower development. Rhipsalis pilocarpa (right) flowers for Christmas reliably in an unheated conservatory and deserves wider cultivation. Bud drop: too high temperatures, fumes from gas combustion (ethylene), too low an intensity day-light, too little water, cold draughts. 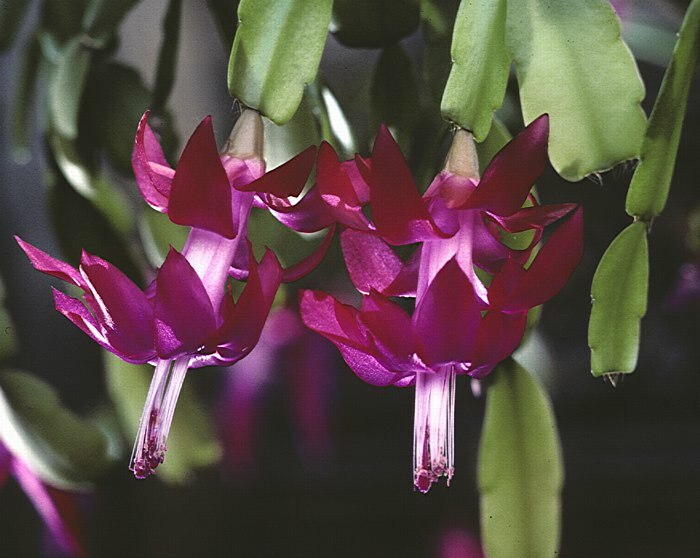 How often: While growing, cacti and succulents cannot go for prolonged periods without water. In the main it comes down to common sense. During the summer when it is very hot, water once a week, giving the soil a good soaking. When the weather is cooler, increase the interval between each watering. The potting mixture should dry out between waterings. During winter, cacti and many succulents rest, so they require little or no water, but this depends a little on temperature and light levels. If you grow plants indoors on the window sill of a heated room, they will require some water during the winter. 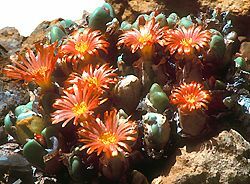 Winter growers such as succulent plants from winter rainfall areas in South Africa e.g. Tylocodons, Testudinaria elephantipes, some Mesembs need a little water during the winter, depending on temperatures, and very little during the summer to promote dormancy. Never leave cacti and succulents standing in water for prolonged periods. This is the most certain way to kill your plants. Water Quality: In many parts of the world, the tap water contains alkaline and other salts, and additives such as chlorine, and should be avoided. Spraying succulent plants with tap water containing salts will leave unsightly white deposits on the plants, and spines or hairs around the base of cacti may become encrusted with minerals. By boiling water, some of the alkaline minerals may be removed but some soluble components will usually remain. Clean rain water is preferable to tap water, and a little fertiliser (e.g. Cactigrow or balanced Chempack) should be added to each watering throughout the growing period. Rainwater barrels can be fed from house or green-house roofs. Clean water can also be obtained from ice forming in refrigerators and freezers and from condensation from air conditioning units. If you are desperate, a simple solar still can produce several litres of water per day in a sunny climate. There are lots of resources on the internet for build-your-own solar still designs, but see right for a typical design. Water from reverse osmosis desalination systems should also be suitable for use, but many domestic water softeners are based on ion exchange resins that simply substitute sodium ions for calcium. Water treated in this way is unsuitable for watering succulent plants as the substituted salts will accumulate. Some of these, usually succulent plants from winter rainfall areas (e.g. Lithops, Conophytums and some other Mesembs, Testudinaria elephantipes, Tylocodons, a few Aloes) grow during the autumn and winter months. Their watering should reflect this. Lithops (left) should be watered from the early Summer to the early autumn (May / June to the end of September in the Northern hemisphere). Flowers usually appear from late August into the Autumn, depending on the species. Water is then withdrawn as the weather becomes colder, and the outer skin allowed to shrivel to a papery epidermis, before watering commences again in the Summer. Dried outer skins can be carefully removed to improve the appearance of plants and improve availability of light to the plant bodies. Conophytums (left) tend to have an even later autumn / winter growing period, and generally flower at the beginning of their growing season. Watering should be during the late summer - early autumn and spring, with a break during the coldest winter months. However, keep an eye on the condition of your plants and start watering before they dry out too much, or they may not recover from their resting period. 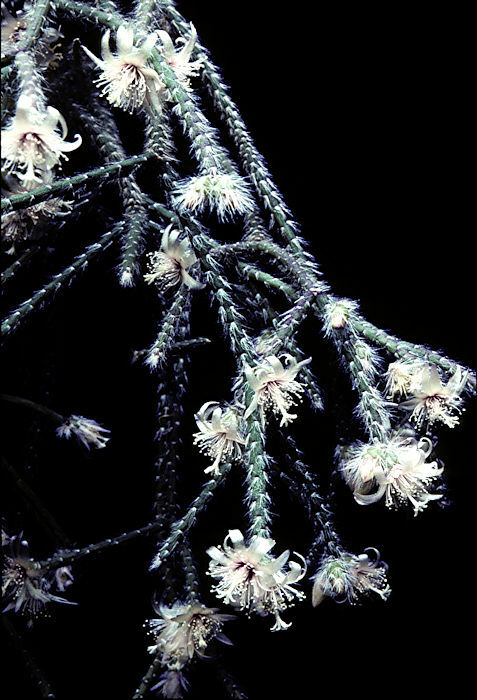 Flowering of many Mesembs is controlled by day length, and artificial lights may upset their normal cycle (although some growers artificially control day length to bring plants into flower at any desired time during the year). Most garden lovers and those with specialist collections of plants would agree that a greenhouse is an asset to any garden. Ideally, a free-standing greenhouse for cacti and succulents should be positioned with the ridge running north-south to maximise the light received all year round. A greenhouse positioned so that the ridge runs in an east-west direction will receive more winter light, which could be useful if it is to house mainly succulent plants that grow during the winter. In either case, it is best to avoid locating a greenhouse where it will be in shadow for a substantial part of the day, to near to trees or in areas subject to strong winds. Positioning the door away from the prevailing wind will help to reduce drafts. Areas of land subject to local flooding should also be avoided. If the greenhouse is sited too far away from the house it may be difficult or expensive to provide supplies of electricity or gas. Greenhouses either have an integral base, or need to be erected on a purpose-built base. A solid floor provides a clean surface under foot and helps to keep out pests. It is an advantage if a solid base slopes slightly to encourage water to drain away. Drainage channels may be moulded in to the concrete to direct water out of the building. However, if you want to plant larger columnar cacti into the ground, then foundations should be constructed around the planting area. Construction of the greenhouse frame needs some thought. For example, should it be made of wood or metal? Both types have their proponents. Wood has a "natural" look and blends in to a garden landscape, but may be subject to attack by insects, tends to rot in humid climates and therefore has a limited life and needs substantial maintenance. However, hard-woods such as cedar mitigate these problems. Aluminium frames tend to conduct away heat and are therefore harder to keep warm than wooden greenhouses. However, they are relatively low maintenance and should last well. Some modern aluminium frames incorporate thermal barriers. The greenhouse is traditionally glazed with horticultural glass, which contains less trace colourants (such as iron) and transmits more light than ordinary window glass. Newer materials such as UV-stabilised acrylic plastic are also suitable and conduct away less warmth than glass. However, some plastics may exude phytotoxic vapours, so always use grades designated as suitable for horticulture. 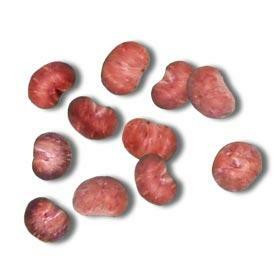 Various double-skinned products are available, but these may reduce the amount of light available to plants, which is always at a premium in countries such as the United Kingdom. This is also a problem with wire-reinforced glass, often used as a roofing material. As with the greenhouse frame, staging can be made of wood or metal, with similar advantages and disadvantages of the materials. After watering, plants become very heavy in their pots. Clay pots are heavier than plastic ones and a peat-based compost is usually lighter than one based on loam (e.g. John Innes). Solid staging, while sturdier makes it easier for mealy bugs and other pests to gain access to plants. Slatted staging lets the air circulate, but pests can still move over it fairly easily. Slatted staging is unsuitable for use with capilliary matting or gravel. There are several methods for heating greenhouses and cold frames during the winter. Electric fan heaters work well, but are expensive. They produce dry heat, so plants require spraying during the winter on sunny days. Tubular electric heaters are available but the plants need air circulation to keep them at their best. If electrical heating is to be used it is worth investigating Economy 7 or similar tariffs. Gas heaters are very successful, but need pipes laid from the house (or heavy cylinders) and installation can be costly. Paraffin heaters work well and are cheap to run, but can produce a paraffin smell, and need to be used carefully to avoid a fire hazard or sooty plants. Under-tray electric heating is an efficient way of applying a little warmth to your succulent plants, and a variety of commercial heating pads can be obtained from horticultural suppliers for this purpose. As an alternative approach, I have clamped eight 25 watt metal-clad resistors (pairs of 10 ohm resistors in series) to the underside of some of the aluminium trays on my staging, and pass low voltage (10 - 20 V) current from a 200 watt transformer through them to provide a warm section of staging. Use an earth-leakage circuit breaker in your supply line, especially if you are using metal staging. Under-tray electric heating is not a complete answer to cold conditions as the roots receive the most heat and dry out. As the plants are warmer, they may need a little water to prevent excessive dessication. However, if water is supplied directly to the pots or via capillary matting, the warmed stage promotes evaporation with condensation in colder parts of the green house. Experienced electricians may be able to make use of ex-equipment fans which are readily available from surplus stores. Check the intended operating voltage, and make sure that you know how to run them safely from your local mains voltage. A small fan strategically placed in the green house promotes air circulation, equalises temperatures and encourages healthy growth.